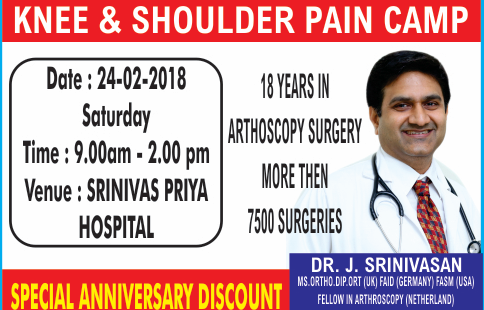 SRINIVAS PRIYA HOSPITAL was inaugurated in the year 1980, with the foremost objective of providing quality healthcare at an affordable cost to people of all sections of life, by the renowned defense scientist the late Mr.N.Jayaraman and the first Obstetrician and Gynecologist of Perambur, Prof.Dr.Rajeswari Jayaraman. The hospital was the first of its kind in Perambur, started initially with a five bedded maternity center, and has developed over time with better medical care, advanced technology and experienced and dedicated medical professionals to the present full-fledged seventy-five bedded Multi specialty Centre. SPH has on board well qualified, and experienced medical specialists, state of the art sophisticated medical equipments and dedicated support staff and the required infrastructure. Excellence in humanitarian service and healthcare for your family and the community as a whole. Keep updated with clinical skills, high standard of academics, respecting the rights of patients and commitment to professional ethics. Oncology is a branch of medicine that deals with tumours (cancer). A medical professional who practices oncology is an oncologist. Referred to as minimally invasive surgery is the surgical procedure enabled with the assistance of a video camera and several thin tube-like instruments. Arthroscopy is a surgical procedure which involves visualizing, diagnosing and treating the problem in the joints. Provides medical and surgical care to women and has particular expertise in pregnancy, child birth, and disorders of the reproductive system. Medical specialty that focuses on injuries and diseases of your body's musculoskeletal system. The medical specialty concerned with the diagnosis and treatment of disorders of the nervous system-the brain, the spinal cord, and the nerves. Diabetes is a disorder, not a disease, therefore when treated properly the person can have a healthy life. The medical specialty devoted to the study, diagnosis and treatment of disorders of the digestive system. Medical specialty concerned with the total health care of the individual and the family. Plastic surgery is a specialty concerned with the correction or restoration of form and function. At Om Fertility Centre, THE FERTILITY BOUTIQUE, all the steps of the procedure (including the consultation, all the ultrasound scans, egg collection and embryo transfers) are done personally by DR.RAJAPRIYA AYYAPAN. It is the place for personlaised individualised approach with maximal results of your fertility potential. OPTIONS TO CHOOSE, CONFIDENTIALITY, TRANSPARENCY are all taken care of, Undergoing assisted conception can be stressful. Counselling is very important at all stages and is part of our management protocol. We hold your hand through thick and thin. Call us +91 44 2551 1111 now for quick help from our experts. We are a team of qualified trained to serve our patients needs. Support and assistance in delivering the future generation. 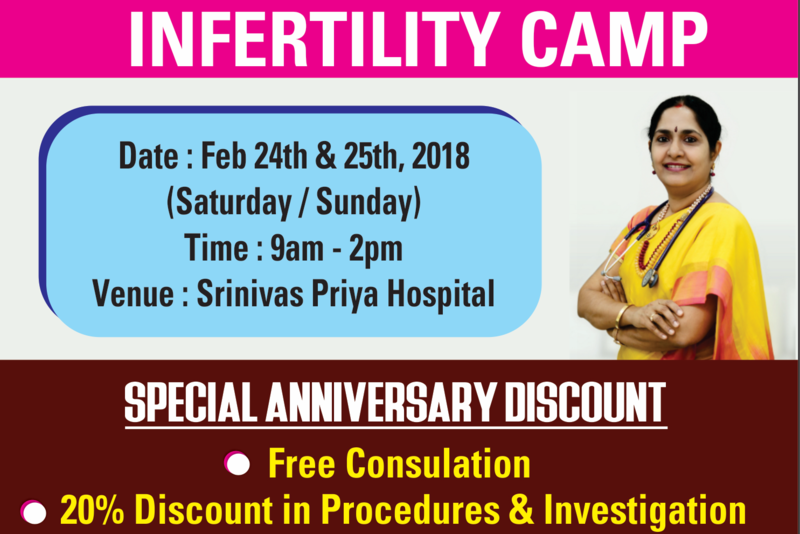 The Director and OBG Chief of Srinivas Priya Hospitals is a renowned Obstetrician & Gynaecologist. MD(O & G)., DNB., MRCOG(London)., Fellow in Reproductive medicine and Andrology. Our dynamic Obstetrician & Gynaecologist is behind the successful functioning of the department of Infertility. One of the prominent oncologists of Chennai who has acquired a name in the field of oncology in Tamil Nadu. Our expert in Bone & Joint problems, started his bright career at Madras Medical College and has been a pioneer in developing the infrastructure at our hospital. “SPH staff are the best I have met all my life. They has been my primary care physician for several years now and has always provided the best medical treatment, and positive advice and treatment during every visit I have made so far. The first step towards a healthy life is to schedule an appointment by complete the request form. Chennai - 600 011 Tamilnadu, India. Chennai - 600 118 Tamilnadu, India.